Simply add one level tablespoon to your milk or yogurt and you get 5 grams of prebiotic fibers inside a great-tasting chocolatey treat. Each bag provides 21 servings. Ingredients: Inulin from Chicory Root Fiber, Undutched Cocoa Powder, Chia Seeds, Konjac Powder, Pink Himalayan Salt, Monk Fruit Extract. Note: Take precaution to only use the serving size suggested which is one level tablespoon. 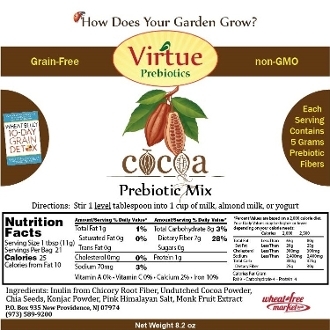 Many people begin a course of probiotics for a few days before adding prebiotic fibers to their diets.